Deep Relief products are topical analgesics – they have effective active ingredients that are absorbed quickly into the skin. 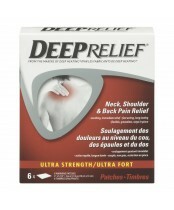 Deep Relief penetrates deep at the site of pain to stimulate nerve endings and distract the brain’s sensory receptors. Deep Relief begins to work on contact, right where it hurts. This is different from oral analgesics, which are ingested and dissolve to release their ingredients over time into the bloodstream and throughout the body.